The opportunity to work on the office expansion of such an elite conference was a dream come true for our team. Within the 32,000 square foot build out, Principal Builders delivered a multi-functional space including private offices, a spacious pantry, an area to display trophies and a flexible assembly and event space to accommodate large groups. Our commitment was to bring the Pac-12 to life in a way that captured their vision of growth, spirit and possibility, while honoring the conference’s century-long history and high standards. We accomplished this by integrating wood, glass, heightened technology and graphic wall displays into construction – enhancing the message of exponential growth through a combined power of 12. 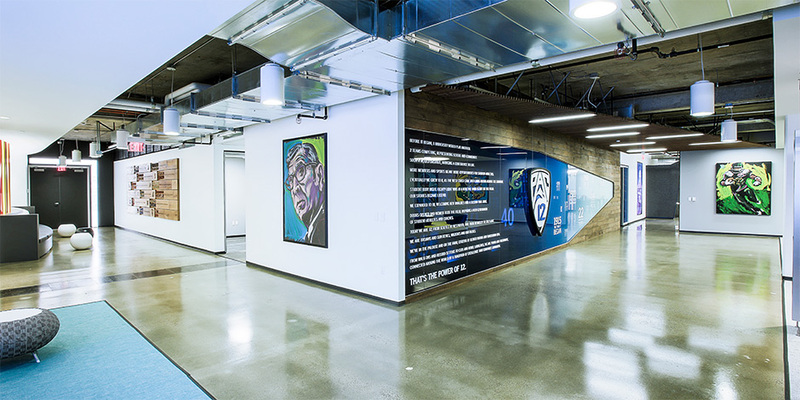 Working directly adjacent to the ­­fully operating Pac-12 Network television station for 14 weeks without interrupting broadcasting was also a significant achievement. To accomplish this and the project’s other goals – quality, on-time delivery, budget management – Principal Builders utilized traditional budgeting practices, proactive scheduling and quality goals early in the process. Principal Builders and HLW are thrilled to have created an atmosphere that the Pac-12 can proudly call ‘home’.